The GC1300 is a single-channel PCI-based Arbitrary Waveform Generator. It is a high performance waveform generator that combines many powerful functions in one small package. Supplied free with the instrument is Arbconnection software, which is used for controlling the GC1300 and for generating, editing and downloading waveforms from a remote computer. The GC1300 is sensible alternative to a GPIB based waveform generator when developing a PCI–based test system. The GC1300 provides a synergistic combination of a function generator, arbitrary waveform synthesizer, programmable sequencer, pulse generator, and modulation generator in one instrument. The GC1300 delivers all this at a lower cost than comparable bench-type, or VXI- based instruments. This versatility ensures that the GC1300 will adapt to future testing needs as well as current ones. New technology requirements are driving communications systems to use increasingly narrow channel width. A high sample rate of 125 MS/s makes the GC1300 an ideal modulation source for troubleshooting new encoding schemes. The GC1300 also provides high-speed waveforms to stimulate signal distortion, power line cycle dropouts, video signals, component failures and power supply transients. 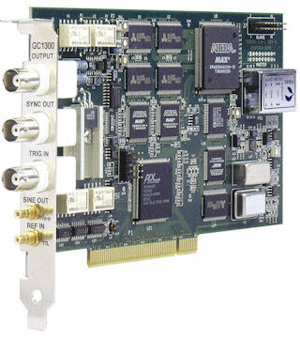 The GC1300 provides 2Meg of waveform memory as standard, far more than competitive models. This waveform memory is accessible via a high-speed interface. Also, waveform memory is segmentable, allowing the storage of up to 4,096 different waveforms of variable size. This allows test software to switch between many different waveforms rapidly and without having to download multiple times, enhancing test throughput in a way that cannot be duplicated by other competing products. Powerful sequencing capability allows linkage of up to 4096 waveform segments and/or bursts (repeated segments) into strings. A segment can be repeated up to 128 K times in burst mode. Sequenced functions run continuously or are initiated by a trigger. It is also possible to mix continuous and triggered segments within one sequence. These sequencing features permit the creation of complex waveform or pulse patterns using minimal amounts of memory. Sequences are created by writing a sequence table. Sequence table download is extremely fast because ArbConnection writes to registers and does not require the overhead of an embedded controller. In addition to continuous output, the instrument can also wait for a trigger to initiate a single waveform, a burst of waveforms or a sequence of waveforms. Triggers can also be used to advance a sequence of waveforms one segment at a time. The GC1300 accepts the triggers from a front panel trigger input, and from manual commands such as *TRG. With the GC1300’s ArbConnection software you can control instruments functions, modes and features. You can also create virtually and unlimited variety of test waveforms. Freehand sketch allows you to draw your own custom waveform for quick analysis of analog signals. You can use the built-in equation editor to create your own exotic functions. Add or subtract components of a Fourier series to characterize digital or analog filters or, inject random noise into a signal to test immunity to auxiliary noise. The GC1300 has outstanding low phase noise characteristics and carrier stability. Such characteristics are very much needed for telecommunication and channel separation applications. On the other hand, the output of the GC1300 can be made extremely agile for applications needing sweep, FSK and FM. The sample clock of the instrument is derived from a DDS (Direct Digital Synthesis) circuit so controlling instantaneous frequency is a matter of changing its input bits. You, as a user, should not really care how it is done but the end result is magnificent: functions like wide-band FM, wander, linear and logarithmic sweep are easily created and executed by the generator. A unique an extremely useful feature of ArbConnection is the FM composer. The FM composer screen looks very much like the Wave composer screen except the “Y” axis is given in units of frequency, so waveforms you create using the FM composer generate frequency change over time. You can create any arbitrary waveform shape or even use the equation editor to generate exotic shapes which eventually you can use to frequency modulate your main output. The last but not least is flexibility of the GC1300 as an Arbitrary Waveform Generator. Combined with the power of ArbConnection, there is no limit to what you can create and generate. Waveform coordinates can be imported from a variety of sources such as MathLab, ASCII files etc. Anything you can show on one of the composer screens is downloaded in a split of a second and generated by the main output. Place 2 or more GC1300’s in a chassis and harness the power of multi-instrument synchronization to create multiple, phase-controlled output channels. Then vary module-to-module phase offsets to create multi-phase signal source.